Sinevibes' Turbo plugin is celebrating its fourth birthday and, by way of celebration, it's being offered as a free download until the end of 18 December. This audio manipulating plugin takes an input signal and bends its shape using one of eight sine-based transformer functions, adding new harmonics to it in the process. Vibrations and 'beatings' are said to be emphasised, and there are also filters on the input and output. 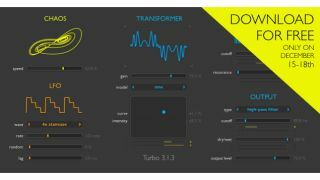 All of which adds up to a plugin that lets you turn simple sounds into something completely different: you can grab Turbo as a Mac AU plugin from the Sinevibes website.